Japan’s Prime Minister Shinzo Abe expressed deep remorse today over the second world war and said previous national apologies were unshakeable. But he emphasized future generations should not have to keep saying sorry. In a closely watched speech just ahead of the 70th anniversary of the end of the second world war, the nationalist premier appeared to tread a fine line between regret over Japanese wartime aggression while also focusing on what Japan had done since Tokyo’s surrender. “Japan has repeatedly expressed feelings of deep remorse and heartfelt apology for its actions during the war.... we have consistently devoted ourselves to the peace and prosperity of the region since the end of the war,'' Abe said. But he added later that future generations of Japanese should not have to continually apologize. “We must not let our children, grandchildren and even further generations to come, who have nothing to do with that war, be predestined to apologize,'' he said. 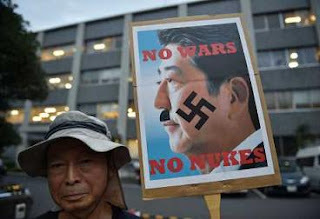 Japan's war time history has come under a renewed focus since Abe swept to power in late 2012. He has been sharply criticized by some for playing down Japan's past and trying to expand the role of the military.